Martha, Martha, Martha … what where you thinking? Turning cookies into a cake? It’s this kind of thinking that made you rich and famous. Spotted in the July issue of Martha Stewart Living, I just knew this dessert—alternating layers of homemade chocolate chip cookies with a marscapone whipped cream—would make my recuperating friend very, very happy. Okay, okay, I admit it, it would make me very happy, too. But I needed an excuse … and a houseful of people to eat it. No better time than weekend visit to Provincetown, I say. 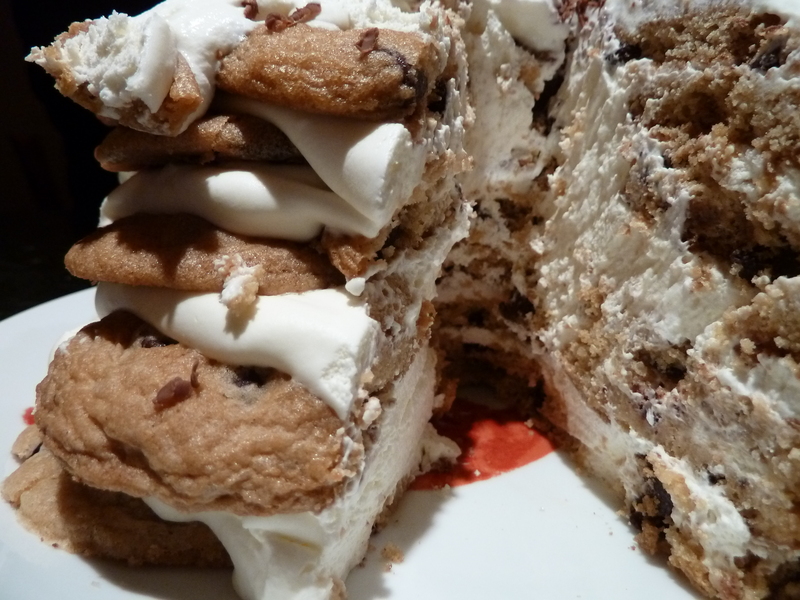 As I said, the cake is layers of cookies—seven layers, in fact—and whipped cream. As it sits in the fridge overnight, the cookies soften a bit, just enough, from the whipped cream surrounding them. By the next day, you can slice right through the cake with no trouble. 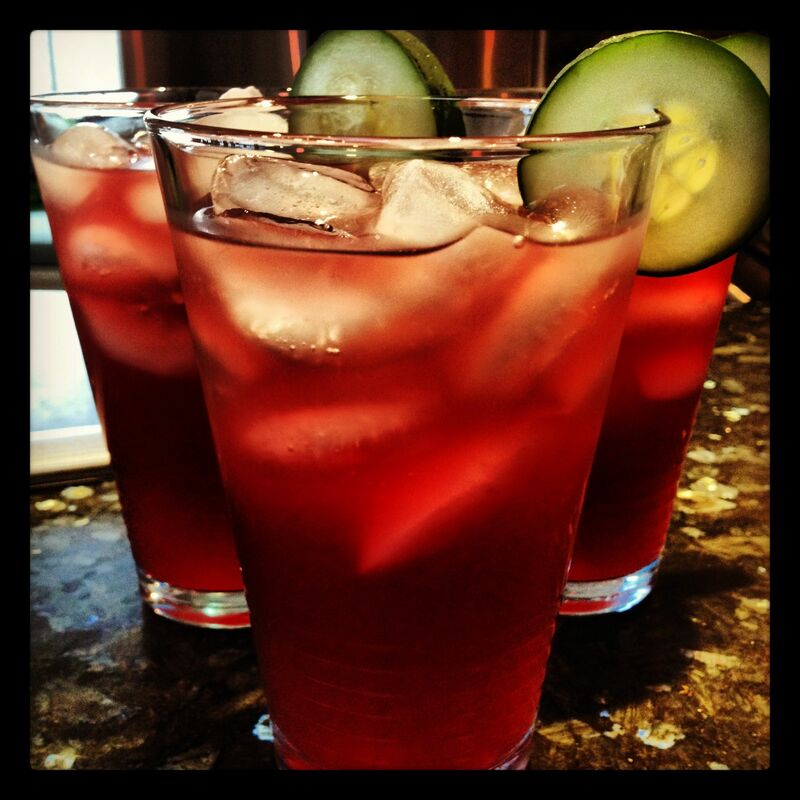 -Chill a mixing bowl (preferably from a standing mixer). Whip up the heavy cream, cheese and sugar on medium high speed at first. It takes a while to form soft peaks. When it does, taste for sweetness and add a bit more sugar if you wish. Continue whipping until the mixture stiffens. Refrigerate until you’re ready to assembly the “cake.” At least an hour. -Arrange 5-7 cookies on a plate or cake stand. If you use a plate, make the surface as flat as possible. -Scoop out a big dollop or two of the cream mixture and spread it over the first layer of cookies. Don’t make it too thick or you’ll run out before you build up your seven layers. And don’t make it too thin or there won’t be enough cream to soften the cookies. -Continue stacking the layers of cookies and spreading cream. Put your structural engineer’s cap on and try to build it as sturdily as you can. -Really, it doesn’t matter how many layers you make it. If you want leftover cookies, great – don’t add as many layers. 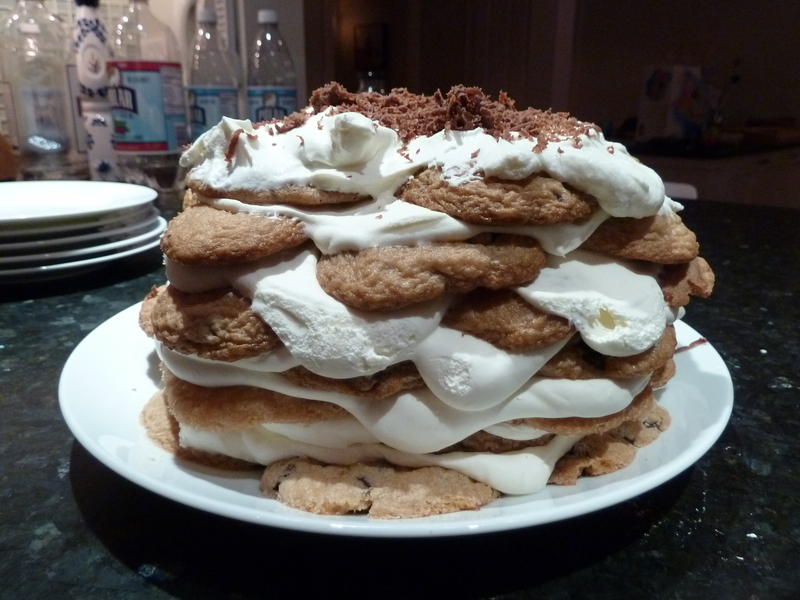 Just make sure you end with a layer of cookies on top and about a heaping cup of cream. Pop the cream in the fridge. After sitting in the fridge overnight, the cookies are surprisingly easy to slice through. -Cover the cake with plastic wrap. I lightly inserted a few toothpicks on top to make sure the wrap didn’t cling too much to the cake. Pop that in the fridge, too. Let it sit overnight. -When you’re ready to serve, spread the last cup of cream over the top of the cake. Grate some chocolate shavings on top if you wanna get fancy. This would be a fun cake for a kid’s birthday party. If you cover the cake completely with cream – sides, too – they’ll have no idea it’s filled with cookies. Surprise! Cookies! Cake! Whipped cream! You’ll be the hero. I have a secret. One of my favorite cooking mags is Everyday Food. That small-sized Martha Stewart pub is packed with some simple, easily put together recipes. We’ve been getting it for a few years now and it’s one of those things that if I don’t read one or two or three issues in a row, I don’t really miss out on much. There’ll be something I can get out of it the next time. For it being The Year of Ellen Baking, I haven’t really been baking all that much. Yes, I bake bread a LOT more than I mention here. And I am working my way through the Flour cookbook, although not that steadily. 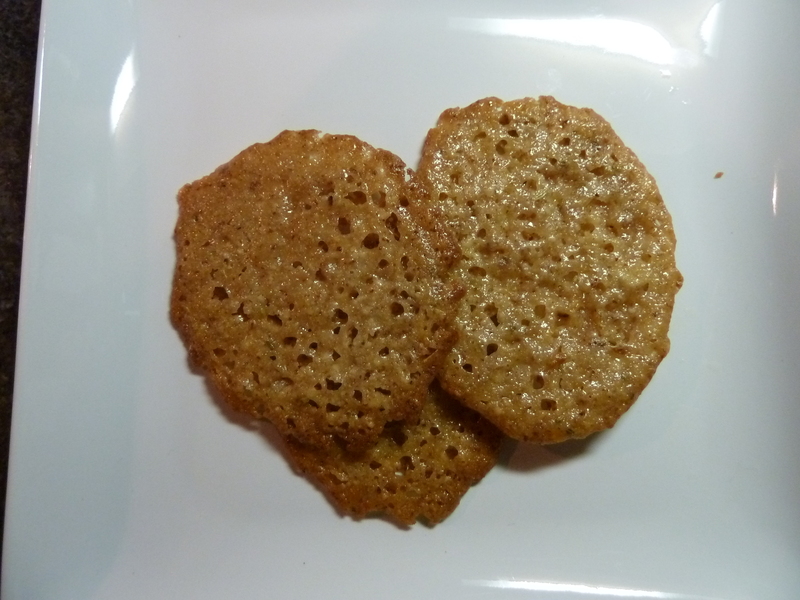 So when I saw the recipe for Lacy Almond-Orange Cookies in the April issue of Everyday Food, I decided to put that apron back on and give it a go. In fact, the cookies were in the oven by 7am today. 1 tbs grated orange zest. Um, where’d that orange go? It was here yesterday. Hence the lemon substitution in the header. -Preheat oven to 375F with racks in middle. Line baking sheets with parchment paper. -It says to put almonds and fennel in food processor and pulse until coursely ground. I used my coffee grinder instead. -Put mixture in small saucepan, add butter, sugar, honey and salt and bring to a boil over medium-high heat. You may want to keep an eye on it or turn it down slightly. Mine started to burn a bit sooner than I expected it would. Stir to combine ingredients. -Boil 1 minute. Remove from heat and add flour and zest. This stuff is going to seize up on you fast, so work quickly to spoon teaspoonfuls of batter onto the parchment about 2.5 inches apart. It says the recipe makes 24 but I only got 18, so if you want 24, make the spoonfuls on the smaller side. -Put in the oven for 4 minutes, take out and turn the sheet pans around and put back in for another 3-4 minutes. Let the cookies cool on the trays on wire racks. I must never have had a lacy cookie like this before. Otherwise I would not have made these. They aren’t as crisp as I thought. Wait, that’s not true. I just ate another bit of a cookie. Maybe as they continue to sit they become more crisp. Okay, let me put it this way: As a cookie all by itself, I would never eat these. The lemon substitution was okay, but that’s not the problem. They are just too buttery. My face swells with fat just looking at them. Now, I could eat these as an accompaniment to ice cream. Oooh, yeah, that sounds good. But, these are not cookies I’d keep around and just munch on, which means I probably don’t need two dozen of them anyway. And, that also means I’m giving them to Jennifer to distribute to her work colleagues. I wonder if they freeze well … I’ll keep a couple in the freezer for the next time I have some ice cream. I’ll let you know. You are currently browsing entries tagged with Martha Stewart recipe at The Dainty Dot.